Up and At'em: Today I woke up just before sunrise & headed for the coast. It took me almost 45 minutes. The trip made me realize how nice it is to live on the Kennebec River and in Augusta, 45 minutes from the mountains; 45 minutes to the sea. I took the two-lane highway, 17. When I got to Rockport, I was racing the sun, yet not breaking the speed limit (by much). I saw the harbor. The boats. I wanted the coast. The rocks. Ahhh, I spotted it! I stopped my truck with a stall. Quickly grabbed my camera, lenses, cell phone, i-pod, toaster oven ... gotcha. Anyhow, I dashed (you can do that up here, dash, because it's kind of like England only New- hence New England) down to the beach. I put my feet in, Ahhh. Then I started thinking it's going to be pretty hard for me to take any pictures here anyone hasn't seen before. All those inferior artists that came here before me mucked up the mix. I decided to make a phone call and found that my flip phone had split in half when I fell. I made my way back to my truck thinking, 'Maine has such wonderful public lands.' Then some horsebackers trotted past. I thought, 'There's some inspiration.' As I was turning my truck around I saw a couple no trespassing signs and realized I was taking pictures from one of the holes of a fancy golf course. So much for public lands. 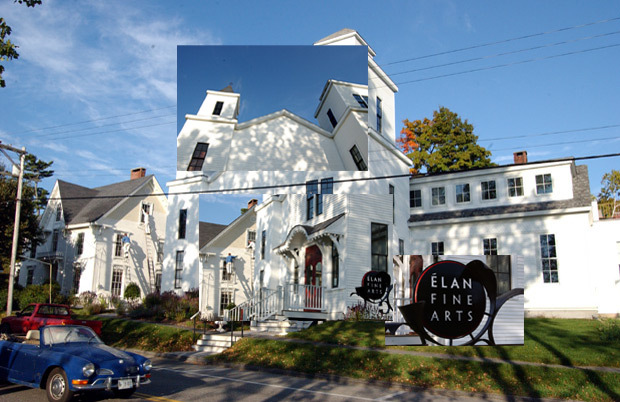 I made a pilgrimage to the Center for Maine Contemporary Art to get some inspiration. It was closed and the horses trotted by again. Well I guess horses are as good as it's going to get this trip. I also stopped by Elan Fine Arts where I met Rusty and Randy who were painting a neighboring house. They even climbed down the ladder to talk to me. I gave them my card and asked if they used the Internet much. Rusty said, "I use it as a tool mostly. It's good to buy stuff." I agreed. And added that it can make anyone competitive, anywhere in the world. Randy agreed. And added they had to get back to work. I snapped some driving shots on the way back to Augusta. 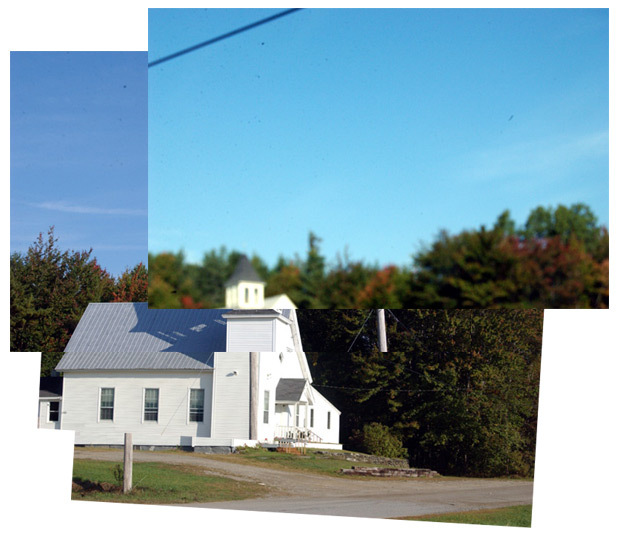 A kind of Christenberry/Evans/Hockney church. Call it a Corcoran church. And I stopped at my storage unit. Slow and sure moves the stuff.